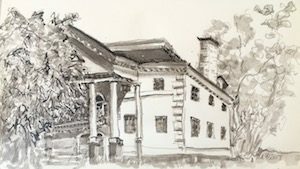 The Morris-Jumel Mansion in upper Manhattan dates back to before the revolutionary war, and is the oldest house in borough. Washington’s headquarters was here for five weeks in 1776, as the army planned and won the Battle of Harlem Heights. With the NYC Urban Sketchers, I toured the General Pencil factory in Jersey City, New Jersey. The factory has been in this brick building for close to a hundred years. I was impressed seeing people hand-crafting the art pencils that I’ve been drawing with, working with much-loved ancient machines.